Will you call your representative on Thursday and ask them to support the petition to force a vote to restore net neutrality? The campaign for net neutrality continues, indeed is escalating over the summer. The coalition for net neutrality, which internet campaign, Protect Our Internet and Popular Resistance are part of, is increasing pressure on the House of Representatives to support a Resolution of Disapproval under the Congressional Review Act. We have passed the resolution in the Senate and are getting closer in the House with 176 votes out of the 218 needed. Thanks to a massive public outcry, the Senate passed a Congressional Review Act (CRA) resolution that would reverse the FCC and restore net neutrality. Now, we’re just a few dozens of votes away from being able to pass the same resolution to save net neutrality in the House. It won’t be easy, but if any movement can pull this off, it’s the movement for an open internet. Join tomorrow’s Tweet Storm. Use the hashtag, #NetNeutrality for the tweet storm, and encourage groups and individuals to send out as many as you can to create a swell from 1-2pm ET tomorrow. 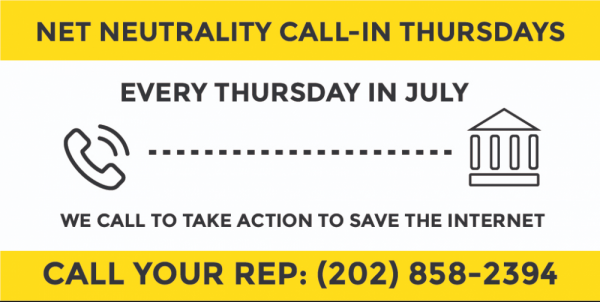 The tweets should encourage people to call Congress via battleforthenet.com/call or 202.858.2394. We’re looking to secure as many votes as possible before representatives head home for the August recess. That’s why we’re organizing call-in Thursdays every week in July. Your member of Congress is key to restoring net neutrality — will you call them today and ask them to sign the discharge petition to force a vote to restore net neutrality? Months ago, pundits and experts across the country repeated their cynical prediction that we could never pass the CRA in the Senate, but we did. We can do the same in the House, but we need to make our voices heard. The fight for net neutrality has been raging for years, and this summer is absolutely crucial. We need to keep consistent pressure on. Join us by calling your member of Congress today!